I was born in Memphis and grew up near Poplar Plaza, one block from Memphis State, in a three-bedroom house that my father bought in 1952. Mom was a housewife, raising not only my brother and me, but also two nephews. Mom liked to take us to Oak Hall to make sure we had nice clothes. We had to be dressed to go out the door. She would be appalled today at what people wear in public. My father was into boxing — he had a boxing ring. My brother and I would go there to box with the professionals. Before we were born, Dad had a recording studio. He turned down Elvis Presley! But he always taught dancing, and I remember him teaching Priscilla Presley in our den. He also had a sporting goods store with his brother. While I was growing up, he sold life insurance. What I realized as I got older is that Dad never stuck with what he loved because he had to raise a family. So I decided I would pursue photography — no matter what — for the passion and not the money. Dad's attitude was, "I never met a man I didn't like." Everyone he met was his best friend. He had the gift of gab, and that's one of the characteristics I inherited from him — being personable. You can drop me off anywhere in the world, and I'll be working by the end of the day. I fell in love with photography when I was in the 11th grade at East High School, and my uncle Ed — who was a photographer in New York — retired and came home with some Nikon and Pentax cameras. We'd play with his cameras, photographing girlfriends and animals at the Memphis Zoo. I got hooked. But my uncle wouldn't give me his cameras; I had to buy them. That meant I had to earn some money. So I got the idea to stage the Fancy Foot Contest with East High football players, where I would line them up, photograph their feet, and have the student council vote on the fanciest feet. I sold the idea to the student council, and they paid me $30. I've been selling ideas ever since. At Memphis State, there were no courses offered in photography, but the college offered a filmmaking degree, so I opted for that as my next best choice. I graduated with a Bachelor of Arts in film in 1976. My first job out of college was with an ad agency. I came out of school thinking I was a photographer, but I didn't know what I didn't know. I lasted about nine months because the agency hired professional photographers from out of town for the really good, juicy jobs and used me as an account executive. I wanted those big jobs, so I quit. I enrolled in the Brooks Institute of Photography in Santa Barbara and got a Bachelor of Arts degree in industrial/scientific photography in 1980. There were only three schools in the country offering commercial photography degrees at the time. I learned all the technical and mechanical aspects of photography there. The owner of The Incredible Slide Makers saw my work in L.A. and hired me to shoot for him in New York City, where I did advertising, special effects photography, and multiple projector slide-shows. When that business closed six months later, I called Pete Turner. Pete started the special effects genre of photography on Madison Avenue. He took one look at my portfolio and hired me on the spot to do work for his studio. What people do today with Photoshop, we did ourselves in camera. During that job, working 14-hour days, I learned how to live on nothing! A fellow PT assistant and I left in 1983 to "travel America" in his Ford Econoline van. We photographed landscapes and animals until we ran out of money three months later. After borrowing money to attend the Brooks Institute and after working for peanuts in New York, I had racked up some heavy debt. When I returned to Memphis, I had two dimes in my hand. That's it. No car and just a little bit of camera equipment. I moved in with my parents, and while I was there, I started getting work. The assignments snowballed. I turned my parents' house into a full-blown photography studio until finally my mother said, "That's it! You've got to go!" So I moved into a building in the Pinch District. The assignments kept coming — especially ones for the medical industry — and I got out of debt in 1989. I then decided to go to Africa for two weeks to photograph animals with the hopes of interesting Memphis in May, whose honored country that year was Africa. They bought my images — and so did other organizations — and my work hung in 17 locations, as well as in the Memphis airport. That was the beginning of the end of my product studio work and the beginning of my being out in the world making photographs. I traveled the country and the world on assignments and on my own, winning awards and honors along the way. But by the early '90s, technology was catching up with me. Photoshop had come onto the scene, so my special effects photography changed to my shooting elements and then assembling them in Photoshop. What I had gone to school for — special effects — was coming to an end and closing right in front of my face. So I reinvented myself. Digital cameras came on the scene, and I resisted to the point of a breakdown. One day in 2004, I woke up with no voice. It was gone. I couldn't do my work because I couldn't speak to my clients. Communication back then was done by telephone, not email or text. I was sitting in the house with nothing to do, and my two dogs were staring at me. I decided to explore digital by photographing them. Their photos sold so well and generated so much interest at a crafts fair, that my current career in pet photography launched on its own, and that's the majority of the type of work I do today. I also give lessons in photography — but making heart-wrenching images is where my passion lies. The first time I held a camera … was when I was six or seven. We were on our annual two-week vacation in Destin, FL — back when Destin was nothing but little shacks. There was a little Brownie still-camera there. I picked it up and started taking pictures, but I just thought of it as a toy at the time. My first camera … was a Pentax H1a with a 50 mm lens that I bought from my uncle when I was 17. During my early years … there was only film photography. The cameras didn't even have light meters. We either hand-metered or knew the exposure. In my early career, film photography entailed … buying film, loading it into the camera, shooting 36 frames using hand-held light meters, taking the film into the dark room, turning the lights off, putting the film in a canister, submerging it into water for 30 seconds, submerging it into developer for four to 30 minutes, placing it in the stop-bath for a minute, transferring it to the fixer for five minutes, turning the lights back on, washing the film for 30 minutes, hanging it to dry on a clothesline for an hour, cutting the frames, putting them in the contact printer, exposing that for a minute, developing it in place for five minutes, washing it for 30 minutes, and hanging it again to dry. That process had to happen for every roll of 36 photos. It could take all day to develop one good print. The most stressful part of being a photographer … Getting paid and waiting for film to come back from the lab. I had to make it happen, not knowing whether I got the shots until I got back home and developed them. I just had to hope that everything I was doing was right. Fortunately, I've been doing 40 years of "right." The essence of great photography is … beautiful subjects and lighting. It's not about the cameras; it's about manipulating and capturing light. Making light work for you. My first animal photography assignment was … in high school with a pair of show Salukis, but I didn't see the connection at that time. What introduced me to the animal photography mode were … horses. While recovering from an illness, I went to a stud farm in California and told the owner that I wanted to photograph his horses. He said, "Sure!" I ended up living there for six months and making brochures of his studs — and he paid me! My pet photography really launched … I was at a crafts fair in 2004, selling prints of frogs, rhinos, lions, and flowers. I also had one photo of my two Westies, Winston and Murphy, on our dishwasher — shot with a 4x5 view camera — with my wife's bathrobed leg and bedroom slipper showing. By the end of the day, I had sold 10 of those! People wanted me to photograph their dogs. I thought, "Well, let's go!" The next week at the crafts fair, I had all dogs on the walls — nothing else — and, boom! My answer to the question, "How do I get a job as a photographer?" is … you don't. You decide what you love to shoot, go shoot it, and hope it sells. One of the earliest lessons I learned in animal photography … Don't put your head in the lion's cage even if you think the lion is asleep! My advice about cameras … Use it for the tool that it is. It's just a screwdriver. Good photography isn't about what camera you use; it's about manipulating the light to make the image communicate. My best-selling photograph … was "Cow in Storm." The cow is lying in the grass as a storm moves in. She's on her stomach, legs folded beneath her, and her head is turned, as if looking at her hindquarters. I shot that on a whim on a farm in Africa. 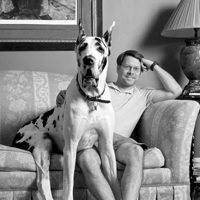 That picture has sold more than any I've ever made until I photographed "Paw in Hand" with Kicker, a therapy dog. A professional photographer is paid … to come back with the perfect shot. You have to make it happen, no matter what, in a limited time frame. Photoshop … is my darkroom now, and I live for the darkroom. I tell photographers, "When you shoot a picture, you're just getting started. The darkroom is where it all happens." Or as Ansel Adams said, "Your digital negative is your score, but your darkroom is your performance." The secret to good dog photography … Dog language is nothing more than positive energy. You keep your mouth shut and speak physically. Relax. Be calm. Dogs feel your mood, your energy. Keep pleasant thoughts. Dogs "hear" that, and they respond to it. The secret to good cat photography … Cats are just as much fun to photograph as dogs if they don't go hide under the bed! Cats are always stalking, so I let the cat be a cat. You can't "put" them anywhere. You have to wait and find out where the cat wants to be, and then you go to work. How the dog-photo process works … I go meet the dog first, scout the location, and let the dog show me the image. I get an idea of what I'm going to do, the house props, the dog's temperament. Then I come back and make it happen. I started shooting animal photos in the pet's own environment when … I was trying to shoot a dog that was so neurotic, it couldn't sit still or get comfortable in my studio. I suggested that we go to the owner's house. We got to use all of their pillows, chairs, curtains, and their props, and the dog was very comfortable. The light came on in my head to do this across the country. The pet prop I never want to use … Treats. They change pets into beasts. One of the hardest parts of shooting pets … Often it's the parents! I've had to ask them to leave the house sometimes. If the parents are anxious, then the dog is generally a basket case. Animals I almost gave up on … I've had two that I had to build blinds for so they couldn't see me. I sat in the blind — just like in a duck or deer blind — and I photographed the dog without him even knowing I was there. The most unusual pet I've shot … I've done ferrets, macaws, snakes, canaries, and crickets. My private studio … sits just outside my home at Horseshoe Lake, AR. I've got a beautiful view of the lake. We built the house to be green — totally energy-efficient. One of my biggest pet peeves … When I photograph a dog, I get on his same eye level, so the dog and I are communicating face to face. When the owners start trying to get the dog's attention from the owner's eye level, the dog starts looking up at the owner, not at me. I really prefer that whoever is in the room assists me and doesn't try to direct. I've been bitten … only once! It was a French poodle — and the owner stiffed me for $125! My favorite photograph … I have two: "Paw in Hand" — the picture of a therapy dog's paw in a boy's hand — and the shot of three frogs stacked on top of one another. Dogs I've Nosed … is a hardcover coffee table book I published in 2007. I came up with the title, even though my publicist tried to talk me out of it. In 2008, I published Dogs I've Nosed II. The first book is now being collected and resold on Amazon for $151.95. My first after-school job … In high school, I found I could take a Mamiya camera, two strobe lights, and two battery packs and make $700 shooting photos at school formals. I did five in the winter and five in the spring and made enough money in a few weeks to last the entire school year. No cash, no flash! Today, the most expensive part of professional photography … Property insurance! In my studio alone, I have to insure more than $75,000 in equipment. And then there are personal property taxes on top of that. It's enough to put you out of business and force you to move to Arkansas. A single pet photo shoot can last … as short as 1/60th of a second or as long as an hour. After an hour, the pet is usually worn out and bored. My trip to Africa in 1989 … was done solely on the hopes that I would be able to sell what I photographed. Charging lions, charging rhinos, lizards, monkeys, insects — I was bitten by every insect that lived there! Fortunately, my photographs sold well and still do today. Photography has taken me … around the world: Africa, New Zealand, Thailand, Brazil, Portugal — and all over the United States. I stopped hunting animals when … I was about 10. I had shot a squirrel. As I held it in my hand, I felt it take its last breath. I said, "I'm not going to do this anymore." Now I hunt with a camera and wish that more people would take safaris with a camera and leave the gun at home. When I was young, I wanted to be … a vet. I've always loved animals. But being a vet meant I had to go to medical school, and my brain doesn't function that way. Items remaining on my bucket list … A trip to Alaska on a motorcycle. I'm trying to arrange that for next year. My final 2 cents … Live in the now — just like dogs do — but always dental floss for the future.